The Muskegon river in the Newaygo, Michigan area is still flowing above “normal” levels at this time, but by no means blown out or un-fishable. It IS however…..still VERY COLD ! After heavy rains and snow melt-runoff from the weather that came through much of the Midwest mid March, the river came up in level, but dropped in temperature. It has/had been stuck around the 32.5 – 33.5 range since then, but is showing signs of warming up, which we’re badly in need of since we have not had much for new steelhead coming in from lake Michigan up to this point. Click HERE for current Muskegon river water flow data down from Croton dam. This “should” be changing in the days ahead, as the river is projected to begin dropping and this, coupled with warmer day AND night time air temperatures, will be the springboard for changing river conditions. Click HERE for current and forecasted weather in and around the Muskegon, Michigan area. With a very delayed onset tot he spring steelhead run, we will likely see the run go well into May this year, which it has done most years over the past 2+ decades of my guiding career. 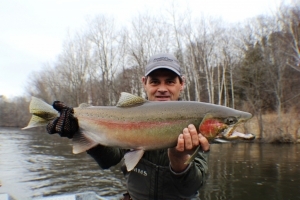 So, don’t discount the 2nd and 3rd week of May for warm weather steelhead fishing ! Not far behind the spring steelhead, will be migratory suckers, who have their respective spawning season coming up and these can be fun fishing behind, for resident Brown and Rainbow trout. The sucker spawn historically happens before the insect hatches begin that provide our best dry fly fishing opportunities of the early summer on the Muskegon river, from late May – late June. Following our major hatches and prime time trout fishing, a shift will take place to focus on Smallmouth Bass, Northern Pike and even a few Walleye here and there throughout July and August. I’m hoping that mother nature will be kind this summer and provide enough water to fish not only the Muskegon river in several sections over the course of 30+ river miles, but also open up the Grand river in and around Grand Rapids, to more summer fishing, as when conditions are right, fishing can be GOOD ! With both fly fishing and light spin tackle equipment, we’ll pursue the salmon of spring and smallmouth – pike of summer. Trout fishing from late May – late June is all about the hatches and dry fly fishing, as everybody likes topwater action ! For now we wait on more steelhead coming in from lake Michigan and a solid spring steelhead run for 2019.